“False Doctrine is…” How do you finish that sentence? What do you say about false doctrine? Does it really exist? Is it simply a matter of interpretation? Can we ever get rid of false doctrine? Is pure doctrine and unity in that doctrine even possible or attainable? The way you answer this question reveals a lot about your confession of faith. To be frank, your own opinion of what false doctrine is doesn’t matter. God’s Word tells us what false doctrine is and where it comes from—False doctrine is satanic. False doctrine is satanic, but hardly anyone wants to believe it. This thought came to me a while back as I read Pastor Andrew Preus’s article “Modern Medicine and Science: Today’s Sorcery.” In it, he expanded upon an analogy that a commenter made on my article, “The Strangeness of Open Communion: Introduction.” At the beginning of his article, he drew a parallel between Open Communion and a pharmacist who practices “Open Medicine,” that is, giving any medicine to anyone who wants it. His point is that if prescribing medicine indiscriminately to patients is harmful to people, how much worse is it to give the Lord’s Supper carelessly to the impenitent and unexamined? (1 Corinthians 11). Pastor Preus asserts, “[t]hat analogy only works if you assume that God exists and that his Sacraments actually contain divine power.” He rightly teaches us that unbelief is behind the practice of Open Communion. This is why people fear the side-effects of medicines more than they do God. The article you’re reading right now is simply the “other side of the coin” to Pastor Preus’s analogy: Just as those who practice Open Communion do so because they don’t believe the power of God’s Word, so too, those who practice syncretism do so because they don’t believe the wicked power of false doctrine. Syncretism and unionism refer to the combining of religions or denominations of differing confessions (Syncretism mixes religions; unionism, denominations). Syncretism and unionism typically happen during times of national or local tragedies. This is what happens: After something terrible occurs, the local authorities invite clergy of all confessions and creeds, regardless of their profound theological disagreements, to lead a religious service together. The service is divided into parts and assigned to individuals—For example, the mayor gives the Invocation, the Muslim reads the Quran, the Lutheran gives a prayer, and the celebrity sings “Amazing Grace” (or some other song that makes a vague reference to “God” or “grace” or “love.”). These unionistic services happened after 9/11, Newtown, CT, and in Orlando after the Pulse Nightclub shootings. National tragedies give Lutherans a free-pass to engage in these services, some would say. Sometimes these services are done when there is no tragedy—Some LCMS churches get together for a “Lessons & Carols Service” each Christmas with those of a differing confession. Some pastors in my own Circuit who do this have argued that this is acceptable because there is no “preaching” involved—The service only consists of pastors of different denominations reading the Bible and singing hymns that are common to all denominations. But the problem is that they give the appearance of unity when there is no unity. Those who believe everything God says are reading His Word along with those who reject and even scoff at what He says. They regard the differences in their denominations as “minor disagreements.” This is usually defended as an opportunity for “evangelism.” But if there is no preaching, then how is this even possible? What’s even the point of engaging in this service for the sake of evangelism if you can’t even evangelize? What sort of “witness” is this giving the world? That difference in doctrine is a matter of opinion? That the pure truth of God’s Word doesn’t matter? That we don’t worship together every Sunday of the church year, but make light of these grave divisions because it’s “Christmas”? To put the best construction on all of this, I believe these pastors are trying to “get the Gospel out,” and provide comfort to those who mourn. For those who have ears to hear, they must learn, however, that they are committing a grave error by attempting to accomplish this through these “inter-denominational” and “interfaith” services. The sad truth is that something is happening that they might not realize. Instead of making a clear confession of the faith, they compromise God’s Word and forfeit the comfort of the Gospel. Why is this? It’s because they put the One true God—Father, Son, and Holy Spirit—on equal footing with the man-made idols and false gods of this world. At syncretistic services, religious leaders aren’t to make any exclusive claims to their “god.” Clergy are invited to give an “inclusive” prayer, reading, or speech. (You can test what I’ve said by preaching the particularity of the Gospel at the next Unionistic Service and see how all respond.) The Apostle Paul said this would happen: “For the time will come when people will not put up with sound doctrine. Instead, to suit their own desires, they will gather around them a great number of teachers to say what their itching ears want to hear. They will turn their ears away from the truth and turn aside to myths” (2 Timothy 4:3-4). The “time” began long ago and is even now. The “sound doctrine” is the exclusivity of the Gospel—Salvation by grace through faith alone in Christ. The “great number of teachers” is the leaders and clergy of all religions and denominations. Their “itching ears want to hear” universalism, that is, all religions lead to the same “god.” The world doesn’t want the truth, the Gospel, that there is no other way to the Father except through Christ—The world wants myths, lies, idols. Therefore, when Lutheran pastors—who once upon a time at their ordination confessed before God and the Church that they believe God’s Word—participate in syncretistic services, they throw the treasure of the Gospel like a needle into a haystack in the hopes that natural man, blinded by sin, would find it (1 Corinthians 2:14; John 14:17; 1 Corinthians 1:18; 1 Corinthians 1:23). They offer a prayer to their God just like every other religion in this world does; thus, they make Christianity appear no different than false religions. Evangelism shouldn’t give the appearance that there is no difference between Christianity and all other religions—Evangelism is precisely the act of confessing the truth that Christianity is the one and only true religion in the face of a world hostile to the Gospel (John 14:6)! This is how pastors are to preach the Gospel—He must “give instruction in sound doctrine and also rebuke those who contradict it” (Titus 1:9). But with syncretism, the proclamation of the One true God gets lost in the clamor of the pagans. The confession of God’s Word is lost in the midst of the false doctrine of other denominations. This is syncretism/unionism. Although we make a distinction between these words today, Rev. Travis Berg taught me, many years ago, there was no distinction and it was all referred to as Syncretism. There’s a reason for that: Neither syncretism nor unionism is better than the other—They’re both equally evil because they both mix the Truth of God’s Word with lies from the devil. This brings me to the point of this article: If all pastors truly believed what God says about false doctrine, then the issue of syncretism wouldn’t even be an issue in our Synod, Districts, or Circuits. Most view the differences between denominations simply as “variation of opinion,” “one of many interpretations,” or “diverse perspectives.” This softens the blow and tries to explain away the severity of the division. But, truth be told, false doctrine is satanic and it always will be. Something can only be true or false—If something is half-true or half-false, it’s not the truth but a lie. Scripture teaches us God’s Word is truth: “Father, sanctify them in the truth; Your Word is truth” (John 17:17). Scripture also says the devil is a liar: “[The devil] was a murderer from the beginning, and does not stand in the truth, because there is not truth in him. When he lies, he speaks out of his own character, for he is a liar and the father of lies” (John 8:44). God is the source of truth; the devil is the source of lies. Whatever God says is true; whatever the devil says is false. Confessing this, we learn the severity of false doctrine. This leaves us with no “middle ground.” Either something is true or false, from God or from Satan. False doctrine is lies about God, and since it is a lie, it is satanic. Therefore, no matter who speaks the false doctrine, and no matter their intention, motivation, or desire, it essentially comes from the devil. What’s the devil’s goal? What is the purpose of his lies? The ultimate purpose of false doctrine is not simply for the devil’s temporal enjoyment, but for man’s eternal damnation. Everything that contradicts Scripture is the devil’s attempt to rip you out of the arms of your dear Father in heaven, to destroy your faith in Holy Baptism, to deny and renounce the God who spilled His blood for you. Lord, have mercy upon us! Even seemingly “insignificant” and “harmless” things are worse than we first imagined. When I was younger, I used to think that the main difference between the LCMS and the ELCA was that the ELCA ordained women and the LCMS did not. I thought this was simply a “political” decision, a difference of opinion, a difference of culture. But after further study, it became clear that this was no minor detail—It was a matter of God’s Word or the devil’s! Sadly, we see the devil’s word being taught in many of our own churches too. For example, when pastors (for whatever reason) teach or “allow” women to read the Lessons in the Divine Service, lead prayers, administer the Lord’s Supper, and give children’s sermons, they are actively teaching the words of Satan himself instead of the Word of God. When God clearly says, “I do not permit a woman to teach or to exercise authority over a man; rather, she is to remain quiet” (1 Timothy 2:12), they teach and do the opposite. But God’s Word is the word we should obey, not the devil’s. This goes for every instance of false doctrine—We should be horrified of it and pray the First Petition of the Lord’s Prayer, that God would keep His name Holy among us! We should do this whenever we encounter anything contrary to what the Holy Spirit has caused to be written for us (2 Timothy 3:16). Make no mistake about it: When pastors and congregations confess or behave contrary to God’s Word, they have been misled by the devil. 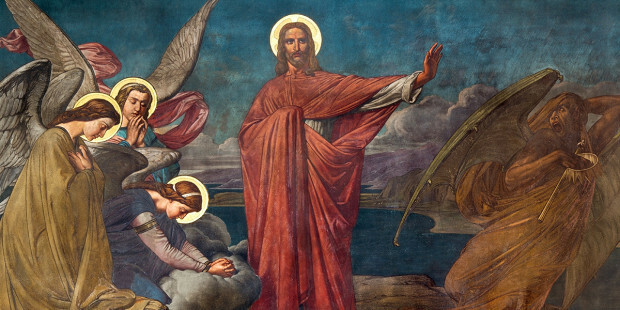 Every church—no matter how confessional and liturgical it may be—must always be watching for the devil’s attack. When there is a false confession or a false practice going around in the church, and when there is a “delay” in rebuking and correcting it, it’s because that pastor believes the false doctrine which they speak or act upon is harmless. Patience is a virtue—But it is a vice when we are “patient” to correct false doctrine and practice. To be patient in addressing false doctrine doesn’t mean to “wait to address it until another time.” It means to “be long-suffering while addressing it”! We shouldn’t wait to address falsehood, we should address it while patiently waiting for God’s Will to be done and trusting that His Word will not return empty. False doctrine attacks faith, no matter how “small” and “insignificant” it might seem. Maybe an analogy here will help. False doctrine is like rat-poison. Rat-poison is made up of 95% dried corn and only 5% actual poison (or some lop-sided ratio like that). Now, who in the world will say, “Look at all the good that’s in here! There’s 95% dried corn. Think of all the health benefits and nutrients and vitamins in this! Don’t worry about that 5%—The good outweighs the bad.” If no one in their right mind thinks it’s a good idea to eat this or to serve it to their children, then why in the world do you think you can do that with theology, which is significantly and eternally more serious? What a shame it is to think that just because another denomination has 95% of their theology right that the false 5% should be overlooked—It infects it all! What a shame it is to try and explain away the devil’s lies as just another wholesome and different opinion! What a shame it is to take the warning labels of pesticides more seriously than the warnings of Christ! Usually, people respond to this teaching with the tired and cliched punchline, “Lutherans think they’re going to be the only ones in heaven.” It’s not that there are no true Christians in heterodox churches, it’s that they are in a very dangerous position. They make no distinction between the lies of the devil and the truth of God’s Word: They are consuming it all. Just as consuming rat poison might not kill you on the first gulp, so too, these false doctrines might not kill your faith on the first hearing of it. But this doesn’t make it any less dangerous. Even though it might not kill faith immediately, it certainly damages it from the get-go. The false doctrine you slowly and steadily consume week after week can ultimately destroy your faith, and lead you either to pride in yourself or to despair of God. The fact that God oftentimes preserves the faith of many Christians in heterodox church bodies through His loving kindness and grace does not diminish the damage and harmfulness of false doctrine—It simply shows the grace of God who delivers many of these Christians from false doctrine through death before those lies stomp out the last burning ember of faith. In other words, he allows them to die physically before their faith in Him dies. It would do us good to remember that false doctrine is not only the presence of evil doctrine, but also the absence of True doctrine. I’ve encountered too many pastors who use books and teaching materials from false teachers in their congregations because it “makes more sense,” or “it’s laid out better.” They give disclaimers saying, “This book isn’t Lutheran, but at least it teaches the core truths of Christianity.” (This statement alone tells you a lot about what they believe is a ‘core truth’ of Christianity.) So, they use books from Rick Warren or Joel Osteen or Joyce Meyer and attempt to ‘baptize’ them in Lutheran theology. Others will attempt to skip over the problematic chapters, the ones ‘we’ don’t agree with. But the problem is that deliberately omitting the truth is just as bad as preaching a lie. Jesus tells us that the way to make disciples is by “teaching them to observe all that I have commanded you” (Matthew 28:20). Furthermore, the disciples did not “shrink from declaring to you the whole counsel of God” (Acts 20:27). The goal of teaching the faith is to teach the truth. Truth is at the heart of all Christian education. We are to teach all that is true and only what is true while renouncing all that is contrary to the truth. It’s sad to see we take errors in history or facts or numbers or grammar more seriously than we take errors in the teaching of God’s Word. We hold an absurd double standard when it comes to truth. On the one hand, if a school were notorious for teachers who omit the letter ‘R’ from their curriculum, you wouldn’t send your child there. Why? Because you know that all of language would be corrupted and destroyed by not learning this. That’s only if we omit one letter. It would wreak havoc, stunt the child’s growth, and make him incapable of progressing beyond that point. On the other hand, when false teachers omit entire sentences, teachings, and articles of faith in their teaching of Holy Scripture, we think nothing of it. It’s brushed aside as if Holy Baptism and the Lord’s Supper is just a detail we shouldn’t worry about. We act as if omitting the correct teaching of the Ministry of the Word is insignificant to the Christian life. Thus, we take false doctrine, which has eternal consequences, less seriously than we do any other harmful thing in life. False doctrine is satanic. The devil is the efficient cause of all false doctrine, that is, he invented it. Don’t think that the devil’s lies are harmless. And don’t think simply because you were baptized, confirmed, and raised up in the Lutheran Church that you are impervious to the devil’s attacks. Be on guard always. Fight against the devil’s lies with all of your might and trust that the darkness will not overcome the Light of God’s Word. Find a church that believes, teaches, and confesses all of the truth of God’s Word in both doctrine and practice. Find a church that doesn’t add or subtract to that Word. Support that congregation with your finances so that you will have a place to gather and hear the Word rightly preached and the Sacraments rightly administered. Find a pastor who—no matter how far away he may be—fights false doctrine with the Word. Find a pastor who addresses false doctrine immediately and patiently suffers the backlash and heartache of persecution that comes to those who cling firmly to His Word. Remember that false doctrine is the devil’s way of ripping you out of the arms of Christ. Don’t give him the upper-hand through indifference or apathy to God’s Word. The devil’s lies are strong, but the Word of God is stronger. Your strength and might and reason and senses cannot withstand the attacks of Satan. You need God’s Word. And the one thing you need the most is the one thing you already have. God caused His Word to be written for you. He has made sure that you will not outlive His Word—His Word existed before you and will be there even after you. Cling to all of God’s Word knowing that through His Word, and His Word alone, you receive the gift and benefit of Christ’s vicarious satisfaction for you on the cross. In His death and resurrection, Christ put an end to all of the devil’s lies and proved them to be false. Nothing the devil says is true and neither can it ever lead you to the truth. God’s Word is never false and can never deceive you no matter how hard it might be to believe. Cling to God’s Word tightly knowing that all those who do will have eternal life. Pray that God gives you faith to believe His Word until your final day. And on that Final Day, all of the lies and false words of the devil will come to a screeching halt as Christ comes again to stomp on that serpent’s head and shut his mouth forever. Flee from the devil’s deceit. Satan’s lies will come to an end, but the Word of the Lord will endure forever. They fain would cast from off His throne. Which for Thy Christians they prepare. All those who put their trust in Thee. Thanks to Rev. Christopher Neuendorf’s translation of Dr. Luther’s hymn, “Lord, keep us steadfast in Thy Word.” You can find the hymn and his website HERE. Rev. Roberto E. Rojas, Jr. is the sole pastor of Zion Evangelical Lutheran Church (also known as "Zion New Life") in Winter Garden, FL, established in 1891. He attended the Concordia Theological Seminary in Fort Wayne, IN (M.Div., 2008-2013; STM., 2013-2014). During his studies at the seminary, he participated in a year-long exchange program in the Westfield House in Cambridge, England, and also in the Seminário Concórdia in São Leopoldo, Río Grande do Sul, Brazil. He and his beautiful wife, Erica, are happily married and live in Gotha, FL. Loving the rat poison-ratio analogy. Have to remember that one! I look forward to seeing a great many non-Lutherans — some of my family and friends among them — at the heavenly banquet. In the meantime, we should warn them frequently and fervently of the false doctrine they are consuming and supporting with their money. And we should teach them that it is slowly killing their faith whether they know it or not. My pastor has a great analogy which fits your analysis, Pastor. If you suffer a severe heart attack, which almost kills you, do you want to be brought to a physician who is simply going to offer you a new diet plan and then send you on your way? Or perhaps be brought before a different physician who will recommend a daily aspirin? Or would you prefer to be brought before the Great Physician who offers you surgery/stent implantation, nutrition guides, pharmaceutical prescriptions, exercise regimens, EKG monitoring, pacemaker, etc.? Anyone in their right mind would choose the latter – it greatly increases their long-term survival chances. Likewise, our faith’s long-term survival chances increase as we attend the church with doctrine that most closely follows scripture. Having read through most of Pieper’s Christian Dogmatics, it quickly becomes apparent that the LCMS (despite her current issues) is the true home of scriptural doctrine, taking all of God’s word, leaving none out, and adding nothing to it. According to Jesus, the most dangerous thing in all the world?….Matthew 10:28…false teaching. And note so often false teaching doesn’t kill, it poisons and ALWAYS uses Scriptural truth with it (like when Eve and Jesus were tempted). Beautifully said, Pastor Rojas. I truly worry about our sister congregations of the LCMS and my own, in that they will allow books that are not in agreement with our doctrine to be used in libraries and bible studies. Sadly, this has already been happening—”Lutheran” churches have been using heterodox books to teach the faith for so many years. Lutherans have built up such a great wall against the Roman Catholics that if I were to walk into the church with the Roman Catholic Catechism, they would burn me at the stake. But, if a Lutheran pastor walks in with “The Purpose Driven Life,” or some worthless book like that, then no one bats an eye. That’s because they actually believe Baptist theology. The point is, neither book is good; however, so many Lutheran churches hold a double standard and prefer some false doctrine over other false doctrines. It’s terrible. If we simply asserted the truth of God’s Word, then we wouldn’t have to give “excuses” for using false doctrine to teach true doctrine. It’s absurd, when you think about it. I pray that God would provide more faithful Christians to bring their pastors and churches to repentance and to rejoice in the truth and clarity of God’s Word. Extravagantly involve tested method	adjustments.